Not to be confused with Reaction Motors XLR11. 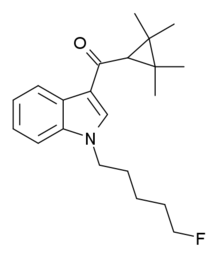 XLR-11 (5"-fluoro-UR-144) is a drug that acts as a potent agonist for the cannabinoid receptors CB1 and CB2 with EC50 values of 98 nM and 83 nM, respectively. It is a 3-(tetramethylcyclopropylmethanoyl)indole derivative related to compounds such as UR-144, A-796,260 and A-834,735, but it is not specifically listed in the patent or scientific literature alongside these other similar compounds, and appears to have not previously been made by Abbott Laboratories, despite falling within the claims of patent WO 2006/069196. XLR-11 was found to produce rapid, short-lived hypothermic effects in rats at doses of 3 mg/kg and 10 mg/kg, suggesting that it is of comparable potency to APICA and STS-135. A forensic standard for this compound is available, and a representative mass spectrum has been posted on Forendex. XLR-11 was instead first identified by laboratories in 2012 as an ingredient in synthetic cannabis smoking blends, and appears to be a novel compound invented specifically for grey-market recreational use. XLR-11 was banned in New Zealand by being added to the temporary class drug schedule, effective from 13 July 2012. The U.S. Drug Enforcement Administration (DEA) made the synthetic cannabinoids UR-144, XLR11, and AKB48 Schedule I, illegal drugs under the Controlled Substances Act (CSA) for the next two years as of 16 May 2013. It has also been banned in Florida as of December 11 2012. Arizona banned XLR-11 on 3 April 2013. As of October 2015 XLR-11 is a controlled substance in China. XLR-11 is banned in the Czech Republic. XLR-11 has been linked to hospitalizations due to its use. XLR-11 has been linked to acute kidney injury in some users, along with AM-2201. 1 2 Banister, S. D.; Stuart, J.; Kevin, R. C.; Edington, A.; Longworth, M.; Wilkinson, S. M.; Beinat, C.; Buchanan, A. S.; Hibbs, D. E.; Glass, M.; Connor, M.; McGregor, I. S.; Kassiou, M. (2015). "Effects of Bioisosteric Fluorine in Synthetic Cannabinoid Designer Drugs JWH-018, AM-2201, UR-144, XLR-11, PB-22, 5F-PB-22, APICA, and STS-135". ACS Chemical Neuroscience. 6: 150508124201002. doi:10.1021/acschemneuro.5b00107. ↑ Frost JM, Dart MJ, Tietje KR, Garrison TR, Grayson GK, Daza AV, El-Kouhen OF, Yao BB, Hsieh GC, Pai M, Zhu CZ, Chandran P, Meyer MD (January 2010). "Indol-3-ylcycloalkyl ketones: effects of N1 substituted indole side chain variations on CB(2) cannabinoid receptor activity". J. Med. Chem. 53 (1): 295–315. doi:10.1021/jm901214q. PMID 19921781. ↑ "XLR-11". Structural, chemical, and analytical data on controlled substances. Southern Association of Forensic Scientists (SAFS). ↑ Wilkinson, S. M.; Banister, S. D.; Kassiou, M. (2015). "Bioisosteric Fluorine in the Clandestine Design of Synthetic Cannabinoids". Australian Journal of Chemistry. 68: 4. doi:10.1071/CH14198. ↑ "CB-13, MAM-2201, AKB48, and XLR11 are classified as temporary class drugs". Temporary Class Drug Notice. The Department of Internal Affairs: New Zealand Gazette. 2012-07-05. ↑ "DEA Makes Three More "Fake Pot" Drugs Temporarily Illegal Today" (Press release). 2013-06-16. ↑ "Attorney General Pam Bondi Outlaws Additional Synthetic Drugs" (Press release). State of Florida. 2012-12-11. ↑ "Governor Jan Brewer Signs Legislation to Combat Production, Use of Dangerous Drugs" (PDF) (Press release). Office of the Governor, State of Arizona. Archived from the original (PDF) on 7 June 2013. Retrieved 2014-08-27. ↑ "Látky, o které byl doplněn seznam č. 4 psychotropních látek (příloha č. 4 k nařízení vlády č. 463/2013 Sb.)" (PDF) (in Czech). Ministerstvo zdravotnictví. ↑ Jordan Trecki; Roy R. Gerona; Michael D. Schwartz (July 2015). "Synthetic Cannabinoid–Related Illnesses and Deaths". New England Journal of Medicine. 373 (2): 103–107. doi:10.1056/NEJMp1505328. PMID 26154784. ↑ "Alphabet Soup, or the newer synthetic cannabinoids...". The Dose Makes The Poison Blog. 11 December 2013. Retrieved 18 September 2014. ↑ Bhanushali GK, Jain G, Fatima H, Leisch LJ, Thornley-Brown D (April 2013). "AKI associated with synthetic cannabinoids: a case series". Clin J Am Soc Nephrol. 8 (4): 523–6. doi:10.2215/CJN.05690612. PMID 23243266. ↑ "Acute Kidney Injury Associated with Synthetic Cannabinoid Use — Multiple States, 2012". Morbidity and Mortality Weekly Report. U.S. Centers for Disease Control and Prevention (CDC). 2013-02-15. Retrieved 2013-02-15.